It’s quiet in the house right now. Coffee is brewing. It’s one of those mornings where I don’t want to turn the light on….just a small lamp for some soft light. The crows are going at it outside. It’s just another morning. My heart has just felt so weird the past couple of days. Sadness over Be’s passing. Intense passion about what God’s asking me to do. Total giddiness over the words and crazy open doors and confirmations and encouragements that are being given to me right now. An overriding desire so strong that you will GET IT. That you’ll make that jump and totally surrender yourself to God. That you’ll just be dissatisfied with where you are. That your spirit will feel hungry and you’ll have an overwhelming desire to feed it. You guys, I’m nothing. I’m just a girl from podunk who knew the truth and royally screwed it up anyway. Who looked for attention in all the wrong places. Who measured her own behavior by those around her instead of by what God said was acceptable. Who claimed to know Him but never spent any time with Him. Who had wake up call after wake up call after wake up call before she finally got it, and by then had a laundry list of junk to deal with. But you know what, He’s been so good to me in all of it. He was patient with me. And He led me out. He brought me to a place of surrender. He’s searching my heart and dealing with my junk (stuff that I didn’t even know I had). And I get it. I’m learning His nature. I know His voice. I can’t sit here and tell you what God wants you to do. If you want to know what He wants you to do, you’re gonna have to start walking with Him. Getting in tune with the Spirit. Start saying yes to the things He’s telling you to do, and all of a sudden you’ll hear Him more and more and more. Be faithful with a little and He’ll entrust you with more (Luke 16:10). See, I can do some planting and watering. I can tell you what works. I can tell you 100,000 times to read your Bible like you inhale. Pray like you exhale. I can thump my Bible and SCREAM IN CAPS LOCK, get bold in bold, emphasize in italic. But Jesus said “No one can come to me unless the Father who sent me draws him” (John 6:44). I guess that’s the faith part. I have to believe that I’m not doing all of this for nothing. That God’s word won’t return void (Isaiah 55:11). That it will draw you to Him. I can tell you that you have to be saved. That He’s already made you holy so you better act like it. That He has a good plan for you. That you “are his workmanship, created in Christ Jesus for good works, which God has prepared beforehand, that (you) should walk in them.” (Eph 2:10). But I can’t make you GET IT. That’s His job. Would you just spend some time in prayer now? Ask God to search your heart. Ask Him to give you more of His Spirit. Then listen to Him when He tells you what to do. When you start to really do that, it gets addicting. You feel so alive, so chosen when you’re walking with Him that you start saying GOD, okay, now what!? Now what!? Let’s do some more, let’s grow some more, give me MORE OF YOU. I’m just a woman reading my Bible and praying and realizing more and more how much I need Him. And you need Him. Respond to HIM, girl! Live out your calling. Make your life COUNT, not safe. Talk to EVERYONE about Jesus. Let them know Him by your life. Let your kids know Him by your life. Let the guy at the grocery store know Him by your care. Fall in LOVE with the one who made you and let that LOVE ABOUND more and more. 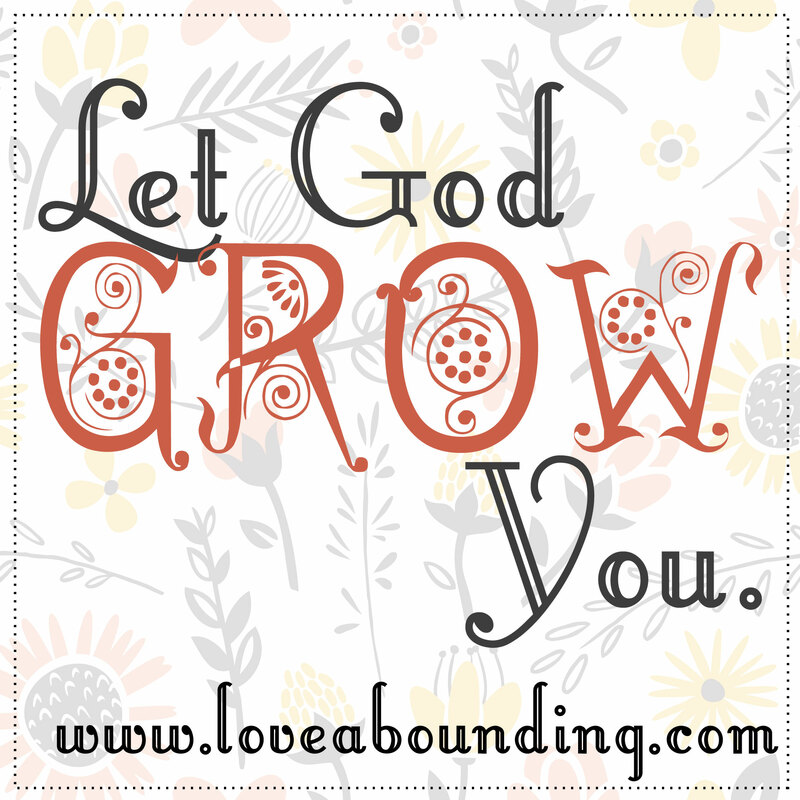 Let God GROW you and push you and chasten you and heal your wounds that you didn’t even know you had. ABIDE in Him and stop being fake about it. Confess your sin and idolatry and burst your safe little bubbles. And I’ll do it with you. This entry was posted in Uncategorized and tagged bible thumping, calling, word on January 4, 2013 by Amy Barnes. Now, let me preface this by saying that my mom is not your average mom. She’s a believing maverick and has spiritual insight like no other mom I’ve ever met. Back to the story, mom pulled me in and curled me up and started talking about how we have to have spiritual food or we starve ourselves, literally making ourselves spiritually weak. I can’t remember all that happened next, but my guess is that she fixed me a mug of warm milk and sent me back to bed with a good psalm and a prayer. Good ol’ Ma. During his temptation, in Matthew 4:4 (and Luke 4:4, oddly), Jesus quotes Deuteronomy and says “It is written, ‘Man shall not live by bread alone, but by every word that comes from the mouth of God. '” What does this mean? This means that the physical is not all there is. We also live by God’s word. What happens to our bodies when we do not eat? We starve. We get sick. We become weak and weary. Our bodies zap ourselves of stored nutrients in order just to function. If the Holy Spirit resides in you, and you aren’t feeding yourself spiritually, the same thing happens to you. Spiritual anorexia. Your growth is stunted. You are left gaunt, debilitated, and ineffective. If you are a believer, the Holy Spirit resides in you. The Spirit in you is like a fire; the fire can be fanned into a flame (2 Tim 1:6), and it can also be extinguished, or “quenched” (1 Thess 5:19). The Spirit takes residence in you to continually sanctify you, which means to set you apart as holy. To move you further and further away from your sin nature. To make you more and more like Christ. To push you to increasing degrees of glory. 2 Chronicles 3:18 says, “And we all, with unveiled face, beholding the glory of the Lord, are being transformed into the same image from one degree of glory to another. For this comes from the Lord who is Spirit.” It’s the Spirit who authored the Word, teaches you the Word, and gives you the ability to apply the Word to your life. This application results in increasing degrees of sanctification. When we quench the Spirit (the word is used to talk about pouring water over a fire), we retard the transformation process. We stunt our sanctification, and the Holy Spirit actually GRIEVES (Eph 4:30)! Perhaps it was a window into His grief that left me feeling so……well, grieved that night. The Word is at the heart of it all. Man lives by bread and…what? The Word of God. It gives us life. It quickens our hearts to the Spirit’s leadings. It fans the embers into blazing wildfires. How do you quench the Spirit? You fail to study the Word. To take delight in it. To see it as God’s beautiful gift to you, His very words spoken to you. The most jaw-dropping, amazing, awe-inducing life changes wait at the tip of His tongue. His words are ALIVE and the Spirit quickens them to you. He teaches them to you. Shows you how they apply to you. But most importantly, they show Christ. They show His character. His face. His love and amazing grace and sacrifice for us. The answer to everything. 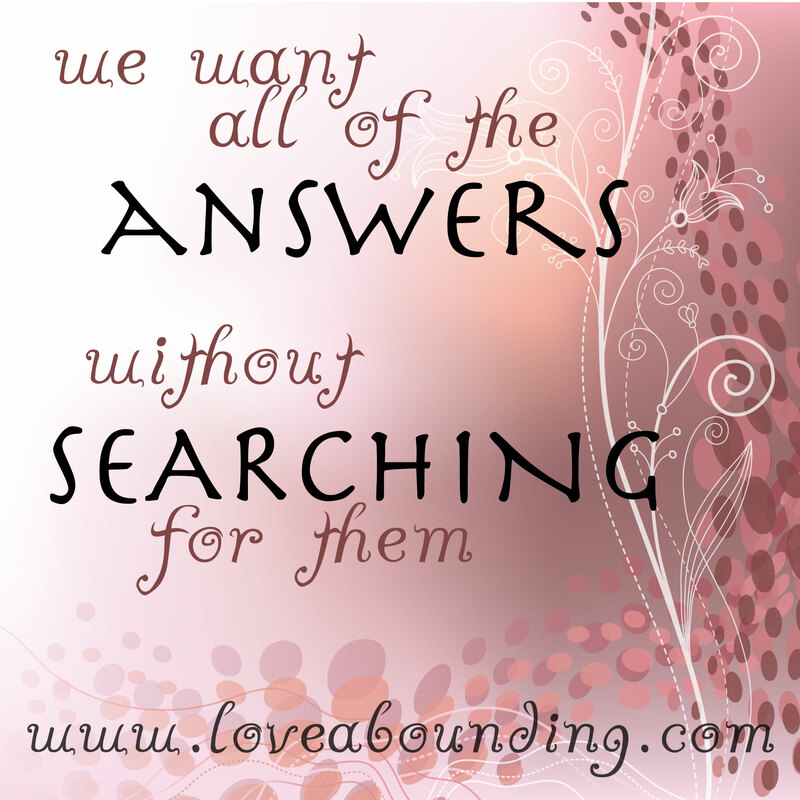 For every question you have, He’s given you the answer….I AM. “What is my purpose?” I am. “Where should I go?” I am. “What do I do about my kid?” I am. The all-surpassing powerful God who called you up from the dead and poured grace over you and gave you life. He wants you. He wants you to want Him. Are you feeling a little parched, love bug? Are you feeling some hunger pangs? Or is that pit in your stomach the echoing of gastric juices just waiting to consume a nourishing home-cooked meal? We like the healthy stuff around here. Good doctrine. Too much junk will give you a tummy ache. Okay, perhaps I’ve gone too far now. Grab your Bible and a cup of something warm, curl up, and delight in your Father. Give strength to your bones. Here’s your Psalm. Why are you downcast, O my soul? Why so disturbed within me? Put your hope in God, for I will yet praise him, my Savior and my God. My soul is downcast within me; therefore I will remember you from the land of the Jordan, the heights of Hermon–from Mount Mizar. By day the LORD directs his love, at night his song is with me–a prayer to the God of my life. Lord, thank you so much for your Word. What an awesome wonder it is that you chose me, and that you’ve revealed yourself to me in scripture. Thank you for the blessing of knowing you. I want to know you more quickly. Create in my heart a desire for your word. Fan the embers of the Holy Spirit in me into a consuming fire. I love you, Father. Thank you. In the name of your Son, Jesus! Amen. This entry was posted in Uncategorized and tagged bible thumping, progressive sanctification, word on December 27, 2012 by Amy Barnes.